The cloud sharing or online sharing war is being fought with much rigor and the users can't complain. The best is yet to arrive but in a small step towards file sharing, the Google Drive desktop version now lets you share file with others from your PC or Mac. And the best part is even a novice can do it, yo have to simply right click the file you want to share, choose share from the Google submenu and send it across to your friends and colleagues. Seems fun. 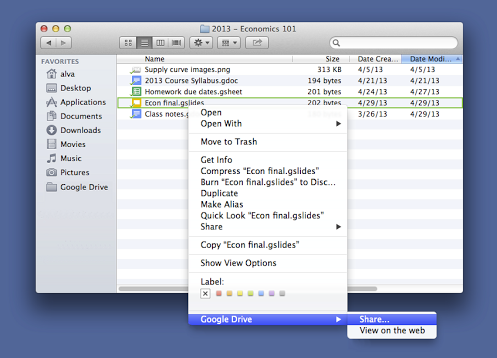 Only remember, you need to have the file in your Google Drive folder. The cloud storage war is getting hot with the providers like Dropbox and SkyDrive giving intense competition to Google Drive. Google Drive is not as popular as these competitors because of the absence of the above option. However Google is rolling out this feature in a phased manner so if your Google Drive doesn't have the share option yet, not fret. It will come within days to your PC or Mac. Check out the full article on Google Drive's latest initiative here and download the new Google Drive here. And wait, the cloud storage war has not ended yet, there is more to come with fresh salvos from the leaders expected soon. Please write in your comment on the article.